Airbus Corporate Jets, a business unit of Airbus SAS and part of Airbus, markets and completes corporate jet variants from the parent's airliner range. Types include the A318 Elite to the double/triple-decked Airbus A380 Prestige. Following the entry of the 737 based Boeing Business Jet, Airbus joined the business jet market with the A319 Corporate Jet in 1997. Although the term Airbus Corporate jet was initially used only for the A319CJ, it is now often used for all models, including the VIP widebodies. As of December 2008, 121 corporate and private jets are operating, 164 aircraft have been ordered, including an A380 Prestige and 107 A320 family Corporate Jet. An Airbus Corporate Jet Centre is based at Toulouse, France and specialises in single-aisle aircraft. 2.6 Airbus ACJ380-800 "Flying Palace"
The ACJ family is based on the successful A320 family of aircraft and was based on the A319CJ. Today any version of the A320 is available as corporate jet with 180 minute ETOPS rating. Changes over the passenger versions include an increase in service ceiling to 41,000 ft (12,000 m) and the use of a variable number of removable additional fuel tanks. The ACJ318 offered a range of 4,200 nmi or 7,800 km. The smallest of the ACJ family, based on the passenger A318, was offered in passenger configurations between 14 and 18 passengers. The ACJ319 offered a range of 6,000 nmi or 11,100 km. This model is the corporate jet version of the A319. It incorporates removable extra fuel tanks which are installed in the cargo compartment, and an increased service ceiling of 12,000 m (39,000 ft). Upon resale the aircraft can be reconfigured as a standard A319 by removing its extra tanks, thus maximizing its resale value. Certificated both European JAA and American FAA, the A319LR and ACJ are the only business jets approved for public transport on both sides of the Atlantic. The aircraft seats between 19 and 50 passengers but may be outfitted by the customers into any configuration. DC Aviation, UB Group and Reliance Industries are among its users. The A319CJ competes with the Boeing BBJ1, Gulfstream G550, and Bombardier Global Express. Because of its wider fuselage diameter, it offers a roomier interior than its competitors. It is powered by the same engine types as the A320, either the CFM International CFM56-5 or the V2527. 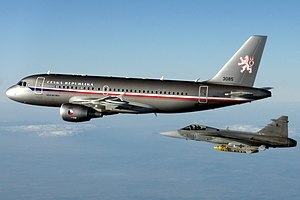 The A319CJ was used by the Escadron de transport, d'entrainement et de calibration which is in charge of transportation for France's officials, and was also ordered by the Flugbereitschaft of the Luftwaffe for transportation of Germany's officials. Since 2003, an ACJ is a presidential aircraft of Armenia, Brazil, Czech Republic, Italy, Malaysia, Slovakia, Thailand, Turkey, Ukraine and Venezuela. The ACJ320 offered a range of 4,300 nmi or 7,800 km. The A320 Prestige is offered as a variant for passengers who want more interior space than the A319 offers. It has a passenger capacity of 30 with two removable fuel tanks. The A321 is the largest narrow body corporate jet with a full passenger range of 4,200 nmi (7,800 km). Two A320neo family variants are offered: the ACJ319neo, carrying eight passengers up to 6,750 nmi (12,500 km), and the ACJ320neo, carrying 25 up to 6,000 nmi (11,000 km). The CFM LEAP or Pratt & Whitney PW1000G lower fuel-burn provides additional range along with lower engine noise while the cabin altitude does not exceed 6,400 ft (2,000 m). To increase its fuel capacity, the ACJ319neo is offered with up to five additional centre tanks (ACT). The ACJ320neo first flight was on 16 November 2018, starting a short test-programme for the extra fuel tanks and greater cabin pressurisation. It was first delivered to Acropolis Aviation on 16 January 2019. The VIP widebodies are based on the A330/A340/A350/A380 aircraft. Additional fuel tanks extend the range, with most increase for the A330 Prestige. The A330-200 Prestige offers space for 60 passengers with a range of 8,300 nmi (15,400 km). Based on Airbus' first four engine design, the ETOPS immune A340-300 Prestige offers a 7,700 nmi (14,300 km) range for 75 passengers. It is powered by four CFM56-5C4/P engines, each rated at 151 kN (34,000 lbf) thrust. The ACJ340-500 is a longer range complement to the A340-300 Prestige with a 10,000 nmi (19,000 km) range as a result of having a higher fuel capacity and an updated wing with increased span and area. It carries 75 passengers and can link almost any imaginable city pair on the globe. It is powered by four Rolls-Royce Trent 556 engines, each rated at 249 kN (56,000 lbf). The ACJ340-600 is a version of the A340-600 with range increased to 8,500 nmi (15,700 km). The A330 and A340 successor A350 XWB is also offered as the ACJ350 corporate jet by Airbus Corporate Jets, offering a 10,800 nmi (20,000 km) range for 25 passengers for the -900 derivative and 270 square metres (2,900 sq ft) of cabin space. One executive variant of the Airbus A380 was ordered in 2012, with two full decks and a third deck in the cargo compartment, but the aircraft was sold as a regular aircraft before modifications were made. Range was to be increased to 8,900 nmi (16,500 km). British tabloids said that the version ordered by Prince Al-Waleed bin Talal was to contain a conference room, a concert hall, a garage, wellness and steam room as well as a lift to enter the plane. The undelivered plane was to be called "Prestige". The Guardian reported the plane was sold amid disputes between Forbes and Talal around the size of his fortune and his efforts to affect his ranking in Forbes billionaires list. As of May 2018[update], plans to retrofit one of the first A380s to be retired from service with Singapore Airlines as a business jet were reported to be "at a very advanced stage". Refitting a retired A380 would cost less than buying a new A330 or Boeing 777 business jet. ^ "Airbus". Archived from the original on 2008-02-09. Retrieved 2008-01-17. ^ a b "ACJ321". Airbus. ^ "Corporate Jets : ACJneo". Airbus. ^ "ACJ320neo takes to the skies for the first time" (Press release). Airbus. 19 November 2018. ^ Kate Sarsfield (16 Jan 2019). "Acropolis Aviation takes delivery of first ACJ320neo". Flightglobal. ^ "Airbus Launches ACJ350 XWB with Easyfit Outfitting". Airways News. May 23, 2016. ^ Jennifer Coutts Clay; Brian Davidson (March 8, 2007). "Airbus A380 VIP 'Flying Palace' Interior Design Unveiled". Space.com. ^ Neville, Simon; Moulds, Josephine (2013-03-05). "Prince Alwaleed bin Talal insulted at only being No 26 on Forbes rich list". The Guardian. Retrieved 14 November 2015. ^ Morris, John (28 May 2018). "First A380 'Royal Yacht' May be Launched Soon". Aviation Week. Retrieved 29 May 2018. ^ "Orders and Deliveries". Airbus. 31 October 2018. This page was last edited on 18 March 2019, at 02:56 (UTC).